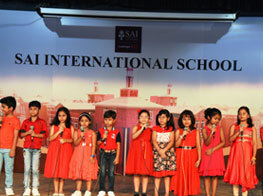 Mother’s Day was celebrated at SAI International School on Saturday, April 7, 2018 to honour the mothers and salute motherhood. A colorful function was organized to make the day a memorable one. Mothers of students from Playgroup to Class III participated in the activity ‘Melon Mania’, where they created magic with water melons. While some of them carved out wonderful designs, some participants made cakes, jelly, drinks with the fruit. Most of the participants had thought provoking creation captions speaking about the importance and nutritional value of the seasonal fruit. Little SAIoneers enthralled the audience with soul-stirring songs and dances depicting the importance of a mother in a child’s life. Pragyan, mother of Saanvi of Class I was deeply moved to witness the wonderful performance of the tiny tots and said “the pure expression of these kids made me feel so complete”. A short movie on Mother’s Day was screened, showcasing the chain of events held on the occasion in the last seven years, which brought back beautiful memories.